Although my favourite style of fishing the Avon is with a pole for roach, there are times when you have to accept that the peg you have drawn isn’t good enough to win with them and that you’ll have to focus attention on other fish. Over the past few years there has been a remarkable amount of big fish such as barbel, tench, perch and eels playing a significant part in many of the matches held on the river. It would be unwise to take part in any of the events and ignore them completely. Indeed, you only have look at the Evesham Festival results to see just how big a part barbel can play over the course of the weekend. I’m not going to spend time talking about how to fish for barbel with pellets and feeder gear as the Matt Maginnis feature in the September issue covered all the rigs and baits in detail. His methods on the Severn will also work well on the Avon under the right conditions. Instead, this month I’m going to take you through my pole approaches for big fish and the use of big rigs and pole feeders. There was a time when a big-fish approach on rivers like the Avon, particularly in winter, meant throwing out a feeder or a big leger bait and sitting back until a fish came along and hooked itself. Now, while this approach can still pick up fish from certain swims on some days, the use of a pole with the correct terminal tackle means you can put your feed and your hook bait in exactly the same spot every time. That’s a huge advantage, whether the match turns out to be a low-weight affair or a free-catching session. You can control exactly how much feed you want to put in and you can keep it really tight. Sensas Herbert floats from 1g to 4g for normal winter levels. Sensas flat floats are better if there’s extra pace on the river. A heavy cage feeder is best when the river is very high. Let’s look first at bonus fish in the summer. It would be foolish to ignore them and in any match I go to I always take a couple of pints of casters and half a kilo of worms to feed down the edge. This is the best bait in my opinion for catching what I call the ‘ugly fish’ of the river – namely perch and tench. To target these fish, I set up a rig to fish downstream from where I’m sitting. This allows me to build up the swim with loose feed, and also allows fish to settle confidently in an area away from any others I might (hopefully) be netting. This ploy is particularly important when the river is running clear. I always plumb up carefully before I feed the inside line because there is a lot of weed and lily pads in many of the swims. Once I’m confident that I’ve found a clear bit, as close as possible to the nearside ledge, I feed the swim by hand with casters, and with a bait dropper for introducing chopped worm. Flow and depth obviously determine where I throw the casters or if I need to do it all through a bait dropper. But in summer the river is normally quite slow, so in front or just slightly upstream is usually right. I use No6 elastic and a 1g to 11/2g Sensas Bernard float on 3lb Shakespeare Omni line for this approach but I never go straight in on the inside line as I think it’s best to build this line up gradually before trying to plunder it. My main approach in summer is with hemp but the first hour of any match is usually spent going for small fish with a groundbait-and-pinkie approach while I’m building up the hemp line. At the same time I’ll be feeding casters down the inside with big fish in mind, so I’ve always got options if the hemp fish don’t show. 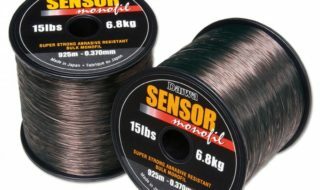 Always remember that this line can produce big fish at any stage in the match, so you must keep some feed going in all the time to attract and keep the fish in your swim. Keep trying this line every 30 minutes or so and if big fish are present you’ll be very unlucky not to hook at least one. By switching between this line, your hemp line, pinkie fish over groundbait and, possibly, a bleak line, there’s plenty to go at to try and build up a weight in a systematic way. In winter months, with extra pace in the river, it’s still possible to catch some very good weights by using heavier float rigs. If the river isn’t pushing too hard, I again use the Sensas Bernard float up to 4g capacity. Usually I loose feed a close-in line by hand with either bronze maggots or casters. For my long line, which is between 13 and 16 metres out, depending on wind and flow, I feed between six and 10 balls of groundbait at the start. These contain casters, hemp, pinkies and a little chopped worm. I use Sensas groundbaits and the mix is made up with a bag of Gros Gardons, a bag of Match Blend, a small amount of red dye and some Terre de Rivierre (soil) if I need to get the groundbait down quickly. After the initial bombardment, I top up the feed by either loose feeding or with small, hard balls which I introduce with a pole cup. If the depth of water is greater than the length of your top kit don’t worry … simply wrap some of the line onto a winder and put the winder into the section. When the river is pushing through very hard even a 4g float can be difficult to control and it’s at these times that I switch to using a flat float. Several companies produce these but the best patterns in my opinion are the ones produced by Sensas under the names Stach and Bogdan. God knows where they come up with the names from, but take it from me that they work really well! Both floats are similar in shape but the Stach has a thicker bristle, making it better in very strong flow. I carry these up to 10g and when the rig is in the water I hold the float totally still by resting the pole across a bar which is fixed onto the footplate in front of me. If the river is very high and coloured after a lot of rainfall I do away with a float altogether, preferring to use a method which is rapidly gaining in popularity with Avon regulars – the pole feeder. I can’t take credit for pioneering the method on the Avon. That credit must go to Lee Gardner, a regular Avon winner who adapted a method that was originally devised, I think, by East Anglia star Nick Larkin. Lee’s had a lot of good weights with this method and I’ve also had some good returns on it this season, with my best being 22lb of bream and roach from Hampton Ferry when the river was carrying an extra two feet of water and was very coloured. My way of fishing the pole feeder is quite simple and if you look at the diagram shown you can see just how it works. The main thing to bear in mind with this method is that you must have sufficient weight on the feeder, to ensure it holds in place immediately under the pole tip, or it won’t work properly. Also, you must get the length of line correct under the pole tip. 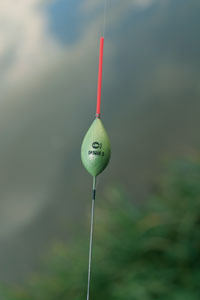 A pole float bristle held in place with two rubbers is fixed just touching the water and just below the pole tip. Because of the set-up, bites are usually unmissable as the fish normally hook themselves if everything is balanced correctly. After mixing the groundbait, add a good handful of cooked hemp. Next, add a few casters and a quarter of a pint of pinkies. Finally, add a good handful of chopped worm. Wet your hands before forming each ball. You’ll need to squeeze the balls hard if the current is fast. Keeping your balls uniform in size will help you to keep the grouping tight. To try and prove the effectiveness of my big-fish and high-river methods, I chose a peg on the Evesham and District AA stretch of the Avon at Common Road, a short distance above the town. It’s a very good stretch of water when the river is at normal level, with roach, chub and bream making up most of the match-winning weights. An overnight frost had lowered the water temperature to 7oC after being almost 10oC the previous day. The river was very coloured and there was a lot of debris coming down. 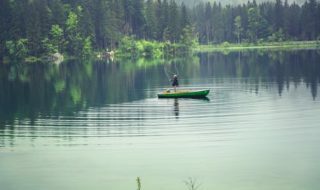 Although many anglers might have turned round and gone somewhere else under these conditions, I was confident my methods would work. Loose feeding the swim was out of the question as the river was pushing through really hard. So I put in 10 good-sized balls of groundbait on the 11m line at the start and initially tried to catch by running a 4g Sensas Herbert float over the top of the feed. Any top-up feed would have to be put in via a pole cup, in small balls of hard groundbait. Despite slowing the bait down as much as I could I didn’t have a bite with this rig, so after half an hour I switched to a 6g flat float. Still no bites were forthcoming and, with the river rising and getting steadily faster, I switched firstly to an 8g and then to a 10g float to hold the bait steady. I introduced a further six small balls of feed over the next hour but plan A and plan B failed. After two hours all I’d got to show was one small eel, so it was on to plan C – the pole feeder. If this didn’t work, my only other option would have been a running-line, straight-lead rig or a feeder fished past mid-river. I didn’t fancy doing this, though, because there was a lot of rubbish coming down the river and it would have been difficult to hold a bait out there and keep it clean for very long. After just half an hour on the pole feeder and with sections of worm on the hook, I was relieved to finally start receiving a few bites. After landing a skimmer bream, I hooked into a good fish that stretched the elastic out quite a distance before the hook pulled. That fish felt like a decent-sized bream, so I was fairly confident of catching a few at that stage. The fish I lost must have spooked any other fish that were present, though, as bites were hard to come by again. After another 20 minutes or so a big roach hooked itself, then I had another eel which was bigger than the first one. This eel proved to be a bit camera shy and promptly did a disappearing act back into the river! Once you’ve settled on a distance, line up the pole with a marker on the far bank. Take your time and launch the balls either in front or very slightly downstream. Always try to keep the groundbait in a fairly tight area, to attract the fish into the swim. A 1lb roach followed by another bream around the pound mark proved to be my final fish of the day. My weight of just under 6lb would not have been enough to win many matches on the river so far this season but, under the conditions, maybe it wasn’t so bad after all. The overnight frost definitely had an effect on the fishing and the river was rising rapidly and colouring up all the time I was there. In hindsight, I feel that maybe I fed a bit too much bait at the start of the session… but I don’t think I’d have caught any more fish on alternative methods. The pole feeder was without doubt the best method on the day and it will, I am sure, continue to grow in popularity as one of the main methods anglers use when rivers around the country are carrying extra water. If you’ve not tried it yet, give it a go the next time your river is up and coloured. If the temperature isn’t too low, you could be surprised at how well you do! Elastic: Original Preston No6 through top two sections. This is the float I’d use on a normal level winter river without too much flow. It’s a very good shape for laying on providing the current isn’t too strong. The shotting pattern is very simple and similar to the arrangement that I described last month for silver-fish work. The rig is usually set between four inches and one foot overdepth with groups of shot below the olivette. On the 3g and 4g floats the olivette is positioned around three feet from the hook and then I place four No8, three No8 and two No8 shot below. The final two shot are set around eight inches from the hook to hold the hook bait steady in the flow. Elastic: Blue Daiwa Hydrolastic through top three sections. This float is superb for laying one to two feet of line on the bottom in fast-flowing water. I’ve got them in sizes up to 10g and there have been a few occasions when I’ve thought an even heavier float would be beneficial, so I’m trying to get hold of some even bigger ones, up to 15g if I can. The shotting pattern, as you can see, is simple. I favour a string of SSG shot over an olivette as I can change the shot load easier if the current is constantly changing. Two No4 shot are placed around eight inches from the hook and these lie on the bottom to hold the hook bait totally steady in the fast water. It’s important to get the correct amount of lead on the feeder, as it must go down to the bottom and not move. Because of how it’s set up, the bites when they come can be real savage affairs but because you’ve got elastic there isn’t a problem when it comes to playing and landing a big fish. 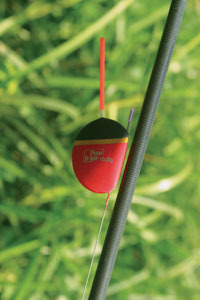 The shot on the hooklength are important to stabilise the bait and the length is varied between two feet and four feet. Length of line is also important. Around six to 12 inches of line between pole tip and water is about right. Once the length is right, place a float bristle just above or just into the water as an indicator. 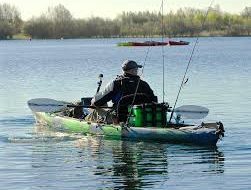 Next Views of anglers needed for new fish movement laws….